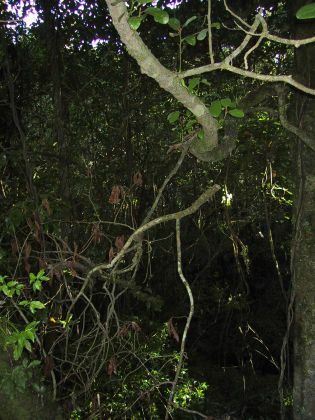 This page is about my visit to Waipoua (pronounced "why-poo-a") forest. 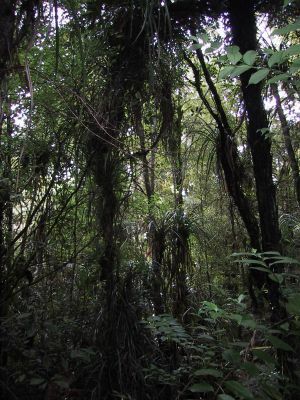 Waipoua forest is in the Northland region of the North Island in New Zealand. There's also a page about the rest of my tour around the Northland. It is a very naturally beautiful, fertile environment. The industries of the small number of people here reflect this - a lot of people are employed in forestry and farming. 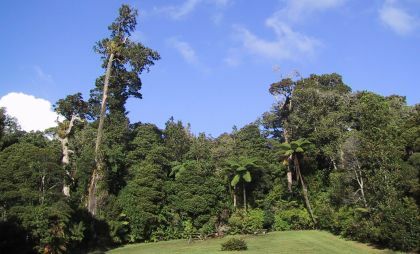 Here's a panoramic view of Waipoua forest from its outskirts. 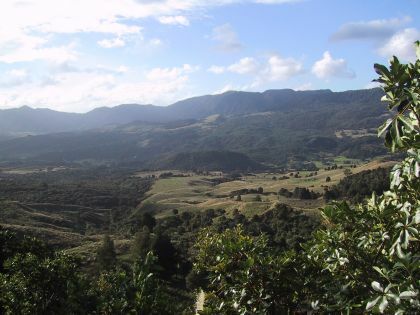 Looking to the left of the picture you can see that the forest spreads out over miles and miles - in total, the Waipoua reserve is 247 hectares large - greater than the size of more than 600 football pitches. one of Earth's most ancient ecosystems. Breathe deeply and tread softly." 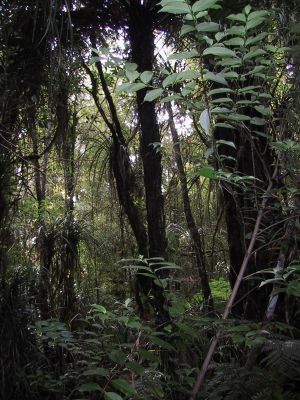 Waipoua forest is often thought of as a kauri forest, but the giant kauri groves only make up a small part of the whole. 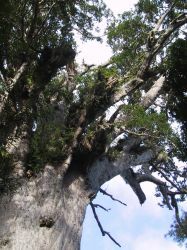 Kauris are large trees indigenous to New Zealand. Look between the great trunks, look up into the canopy, look between your feet. Take your time and you will begin to see a forest of endless variety, complexity and diversity. 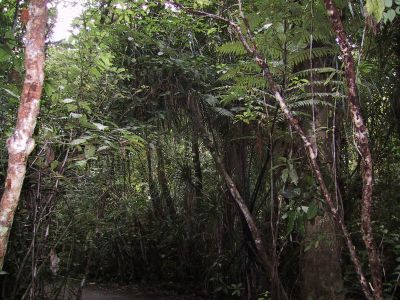 More than 300 species of trees, shrubs and ferns are found in the forest. Our knowledge of the native herbs, mosses and lichens barely scratches the surface of Waipoua's genetic treasure house. In its richness of species, Waipoua is more akin to the tropical rainforests of the south west Pacific than it is to the temperate forests of the rest of New Zealand. All these species are arranged into a complex mosaic of vegetation patterns, shaped by geology, climate and evolution over millions of years. This ancient forest now faces drastic change. 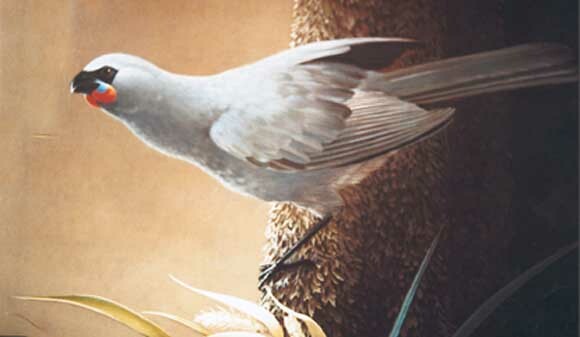 Waipoua evolved on islands isolated from the modern explosion of fast, adaptable warm-blooded mammals. It has poor defences against newcomers released on these islands by humans: rats and cats, weasels and stoats, possums and goats. The predators amongst these have already taken drastic toll of Waipoua's wildlife. 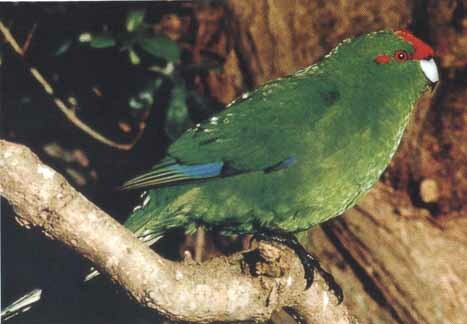 The native parrots kaka, and kakariki have all but gone. Only a dozen or so kokako remain to sing their haunting song, in the deeps of the forest. The plump pigeon, kukupa, is also in decline. 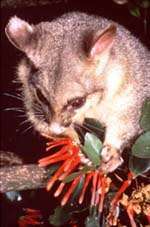 Possums and wild goats could eat Waipoua to a grey shell within a few decades. Populations of both are controlled by continuing hunting, trapping and poisoning programmes. Deep into the forest, and a beautiful clearing by the roadside is found. This marks the place to stop in order to see Tane Mahuta - the largest living Kauri tree in New Zealand. 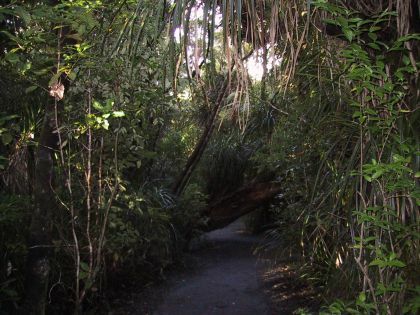 A small path leads you off the road, and into the forest. The diversity of species of plant life to be seen is absolutely staggering. Looking around presents view after view, typical of that shown opposite. New Zealand has many varieties of large ferns and palms living here. 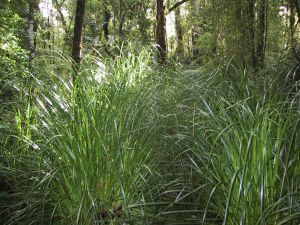 Kauri grass is another native species to be found growing in amongst the Kauri groves. You are in the prescence of one of the most ancient of trees. In Māori cosmology, Tane is the son of Ranginui the Sky Father, and Papatuanuku the Earth Mother. Tane tore his parents apart, breaking their primal embrace, to bring light, space and air and allowing life to flourish. Tane is the lifegiver - all living creatures are his children. The kauri periodically sheds its bark, giving it its hammered appearance. This also frees the trunk of clinging epiphytes. An epiphyte is a plant that derives its moisture and nutrients from the air and rain, that usually grows on another plant. The shedding of old branches and leaves also produces a trunk that is straight-grained, blemish-free and of high quality timber that can be used for many purposes. Despite its immense size, kauri has a comparatively shallow and exposed rooting system with only a few peg roots to anchor the tree. This makes them subject to being thrown about in the wind (windthrow). A humus accumulates at the tree's base, comprising the bark, leaves and branches that are shed. A mat of feeding roots grows through the humus and builds to form a mound (or pukahu). The feeding roots of Kauri trees are shallow and delicate. Many thousands of visitors' feet falling around Tane Mahuta were killing the giant tree, so protective paths and platforms were put around. In the picture, can you see my friend Jenni in her red coat, standing on a walkway in front of Tane Mahuta? The limbs of the crown sometimes double the height of the tree. The leaves grow directly onto the bark clustered at the end of the branchlets of the upraised branches. More than 30 other species live in the branches of Tane Mahuta.